In his late teens, Gary began his industry career with Fyfe Smith Hardwoods, a company which had its beginnings importing hardwood lumber on Canada’s West Coast in the early 1900’s. Gaining experience in all facets of distribution, Gary began his career servicing customers in the warehouse, order desk, outside sales and over time, progressed into leadership and management roles. Along the way, Gary was given the opportunity to be the hardwood buyer for the company and traveled extensively to mills in the Eastern United States and Canada. This provided him with a heartfelt respect for the forests and the people who work in the industry. "I really appreciate the forest lands in North America, the people, and companies who make their livelihood there. These opportunities and experiences have been the foundation of my love of the wood industry and respect for the environment." 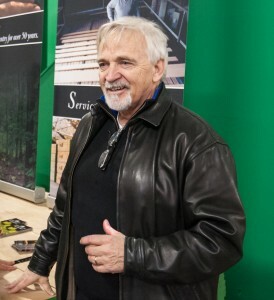 Gary’s passion for the industry continued when he founded McKillican Hardwood Limited in 1978, becoming a wholesale distributor of hardwood lumber and plywood. The company began its partnership with Wilsonart International, Inc. in 1980 and soon expanded across Western Canada. Hardware was introduced to the product mix, with the acquisition of Available Hardware Company in 1992. With the wider complete bundle of products required by its customers, the company changed its name to McKillican American, Inc. in the United States and McKillican Canadian, Inc. in Canada to better reflect its footprint and "Complete Source" product offering. Over the next three decades, McKillican expanded steadily from Texas to Hawaii and currently has 20 distribution locations throughout the United States and Canada. Well into its fourth decade in business, the company continues to uphold the principles and values which are found at the core of its plans, activities, and culture. Our desire is to ensure our people make the right choices for our customers, the company and each other, enhancing our mutual business and career goals. Beyond this, it is our hope that as a group of people, we represent the organization in such a way that we can make a difference in our industry and the world. With a focus on strong leadership and individual stewardship, it is our goal to create upper quartile results and opportunities for our customers, the company, and our people. We are committed to improving our existing knowledge and skills to enhance our effectiveness and productivity. We believe relationships are the foundation of the dignity and pride we exhibit in our job performance. Finally, we believe in a positive approach exemplified with a spirit of adventure in our people.